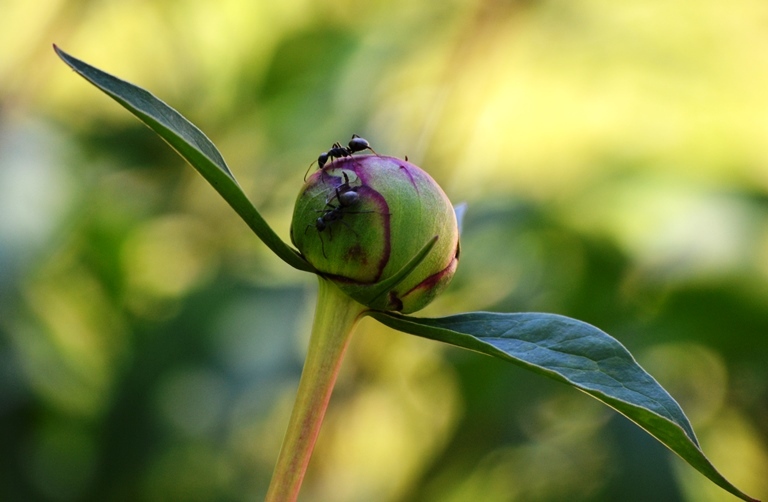 Ants busy on a peony bud. My garden, May 21. The jury is still out on the sweetgum tree. For some reason, that’s the one tree that didn’t come back yet this spring, and as May enters its third week, the death watch is well underway. It might still come back. There was an 8-foot tall hibiscus bush in back with three branches—one leafed out already, and the other two had not. I thought of trimming it before I mowed Friday—but then, surprise, surprise, I noted the swelling green of baby leaves on the two “dead” branches. They weren’t dead at all, they just were in a deeper winter slumber than the rest of the bush. So maybe May is a bit too early to call things. The early riot of color of spring is over, as all but the last few daffodils have faded, and tulips and crocus are long gone. Lilacs and early peonies have come and gone, while the smaller pink dwarf lilacs are blooming and the “regular” peonies are on the way. 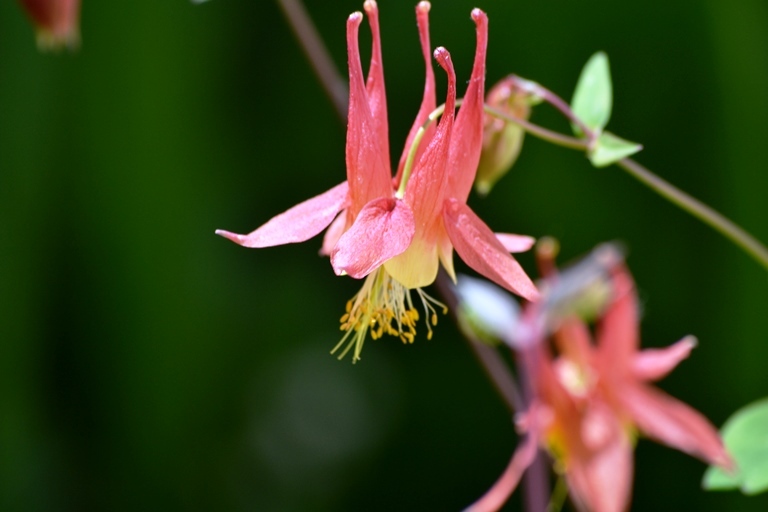 Columbine is in bloom now, too. Photo from May 21. 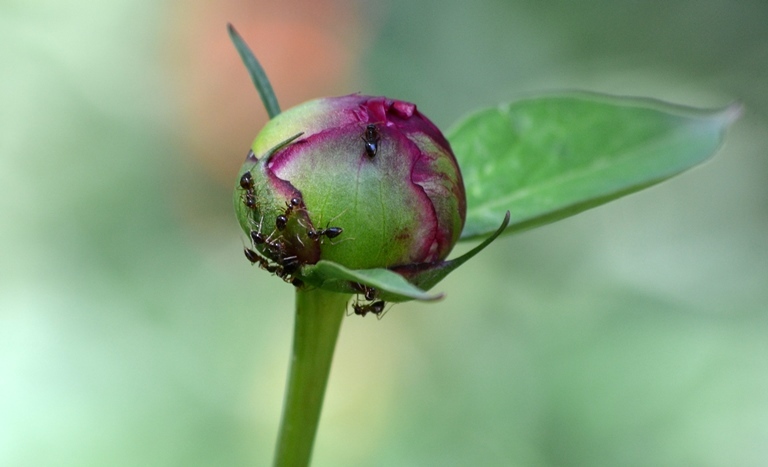 I’m not fond of ants in the house, but unlike some people, I don’t eliminate peonies to keeps ants out of my yard. I would consider a campaign against outdoor ants to be pointless and probably dangerous to me—when they come in, I kill them with blunt force and poisons, when they’re outdoors, they’re part of nature’s order and I leave them unmolested. Which, of course, has to do with peonies. 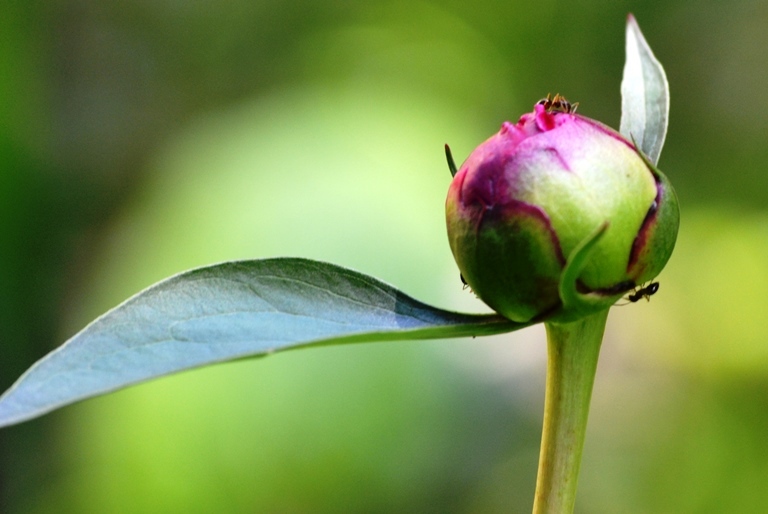 Certain ants love the waxy coating of the buds, and they are having a feast during this in-between time before the many flowers of summer appear and the early flowers of spring have faded. Not that nothing is in bloom. There are three pink lilacs perfuming the yard right now. Several other bushes are in bloom, although I don’t recall their names—a pretty red one in a shady corner of the back yard, a variegated one in front that is obviously planted for its leaves—the flowers are not very showy. Lily of the Valley are in full swing. But the peonies and the iris are still just budding. One iris in back is in bloom. I’m not particularly good with iris—I’ve planted hundreds and have just a handful of plants to show for my efforts—but I do have some that are ready to roll. 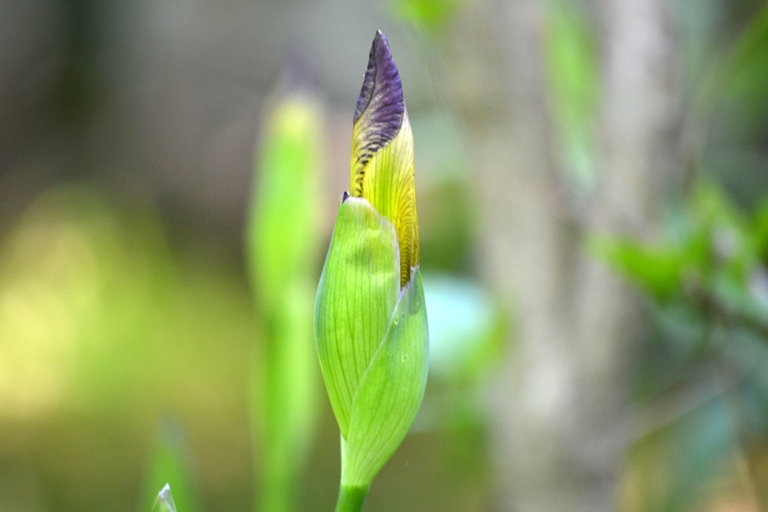 Iris getting ready to bloom. As usual, my garden is behind the times. I’ve noticed a cascade of irises in town, and even some of the traditional peonies are starting. That’s all foreshadowing for my gardens. A few more of my May 21 photos. So this Memorial Day weekend, get out and enjoy the world. As we recall those who have gone before, it seems appropriate that our day for memorials falls right as the gardens are on the brink of riotous life. And maybe there’s still hope for the gumball tree. We’ll see. 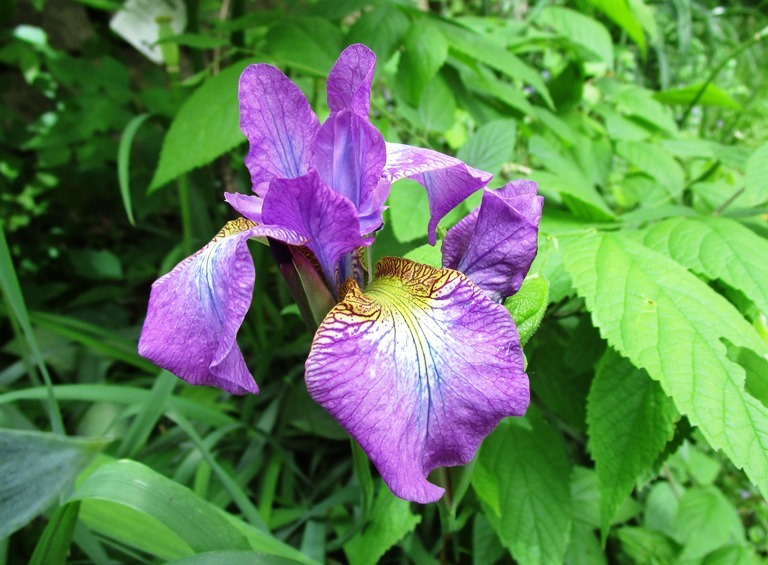 Just before I mowed May 22, I see this–one iris in the garden at the bottom of the rock well is in bloom. I also noted a profuse stand of poison ivy, which I pulled (wearing gloves, although luckily I don’t seem particularly sensitive to poison ivy).